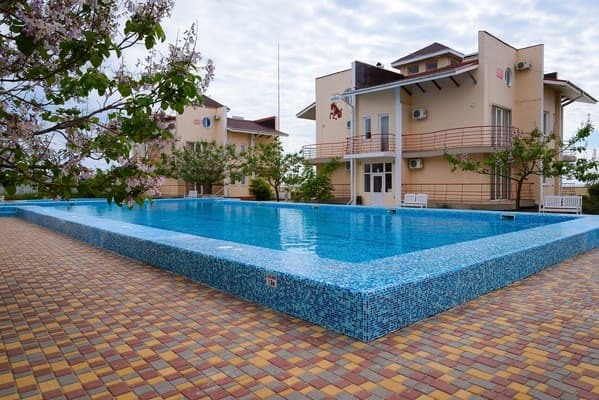 Holiday Village «Veronika» is located in Zatoka at a distance of 50 m from the sandy beach. On one side of the base is the Black Sea, with another estuary. This is the best place to relax on the Black Sea coast. Twelve bodies for rest on signs of the zodiac are located on both sides of the dining-restaurant. You are waited with cozy numbers, silence in the evening, round-the-clock protection. Our specialization is a family vacation in Ukraine. In our territory is a children's playground, free guarded parking for cars. Also, guests can relax in the bar "Zodiac", where barmen will prepare cocktails for every taste and arrange a burning "cocktail show." To the services of loungers, living for a fee, from 20 UAH / day depending on the location. It is possible to book a paid transfer from the railway station in Odessa. The hotel has a POS-terminal for credit card calculation. 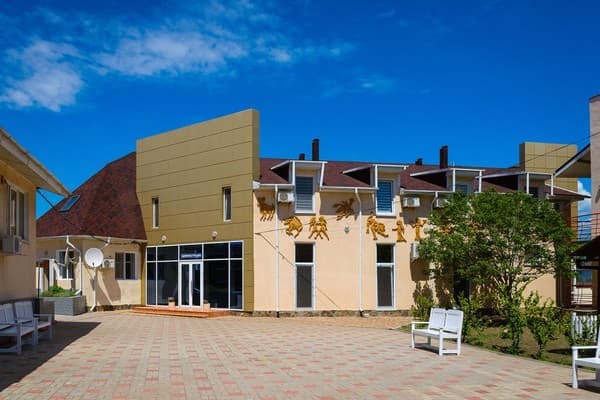 Holiday Village "Veronika" is located 27 meters from the station Druzhba. The distance to the bus station in Zatoka is 2.8 km, to the Solnechnaya station - 1.2 km, to Odessa - 69 km. PRICES MAY CHANGE, IT IS REQUIRED TO UPDATE INFORMATION FROM THE OPERATOR. 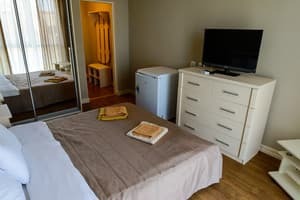 Description of the room: Two-room suite with a total area of 22 sq.m. The main room is 16 sq.m, the second additional room is 6 sq.m. In the large room there is a double bed, in the small one there is a one and a half folding sofa. Exit balcony partly to the parking lot, partly in the courtyard. Perhaps both 3 local and 2 local accommodation. Description of the room: Cozy room under the roof, air-conditioned without sea view. The room does not have a balcony. Third floor. Ideal for a young couple, two friends, two moms with small children, a small family. 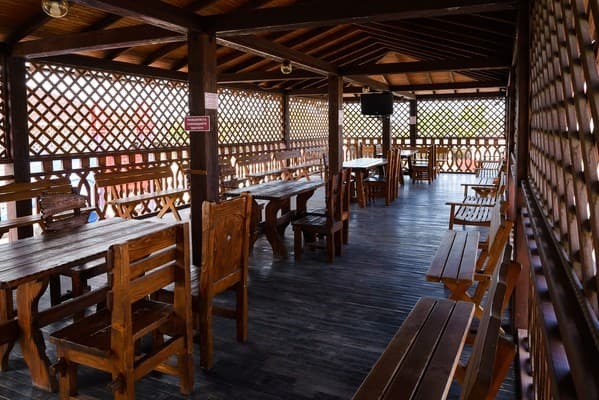 Description of the room: Cozy room under the roof, air-conditioned with a view to the sea. The room does not have a balcony. Third floor. Ideal for a young couple, two friends, two moms with small children, a small family. Description of the room: The room is on the 3rd floor, 3-storey cottage. This room does not have a balcony. The windows face the parking lot. Description of the room: spacious room in a direct sea view on the first floor. 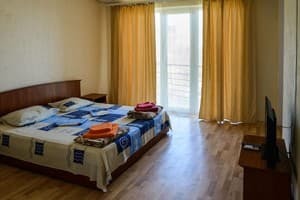 Description of the room: Spacious room with extensive sea view. Description of the room: Spacious room for two with the possibility of placing a third person. 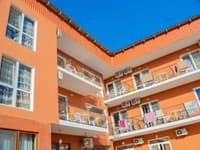 Description of the room: Two-room apartment on the 1st floor with a total area of 22 sq.m. The main room - 16 sq.m, additional room - 6 sq. M. In the large room there is a double bed, in the small one there is a one-and-a-half folding sofa. Exit the balcony into the courtyard (pool or garden). Хороший та ввічливий персонал, прекрасне географічне розташування (правда трохи шумно від близько розташованої залізниці, але це не від них залежить), прекрасно провели час, рекомендую. Необхідно урізноманітнити роботу аніматорів, проводити більше ігр для дітей на свіжому повітрі, на пляжі. Check arrival: from 13:00 - 15:00 hours. Check leaving: to 11:00 - 12:00 hours. Children under 3 years stay free of charge without providing extra bed and breakfast. The cost of additional places for children from 3 to 12 years from 250 UAH to 315 UAH (depending on the season). 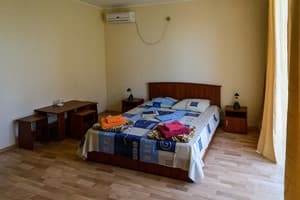 The cost of extra beds for children from 13 years old and adults is from UAH 320 to 400 UAH (depending on the chosen room category and season). The cost of extra beds for children up to the price for a child and all discounts respectively applies only if the room already has two adults and a child in the third room. If on vacation comes only one adult with a child, then the child is paid as an adult. The price includes breakfast. Lunch and dinner can be ordered at an additional cost. Estimated cost: lunch - 120 UAH. And dinner - 100 UAH. There is no kitchen for self cooking. On the territory of the recreation center there is a cafe-bar where it is possible to order cocktails. In 15-20 minutes. Walking distance from the hotel there are cafes and shops. 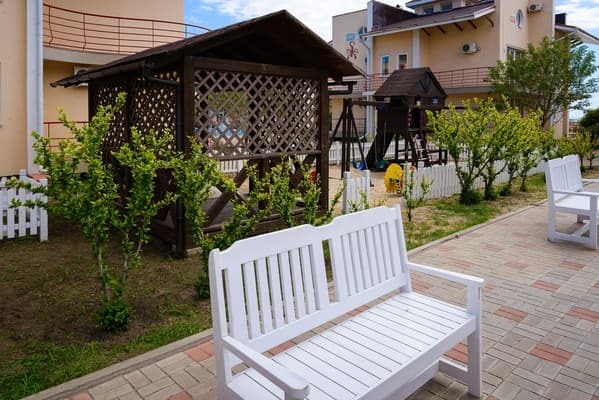 Holiday Village «Veronika» is located in Zatoka at a distance of 50 m from the sandy beach. Distance to the bus station in Zatoka is 2.8 km, to Solnechnaya station - 1.2 km, to Odessa - 69 km. 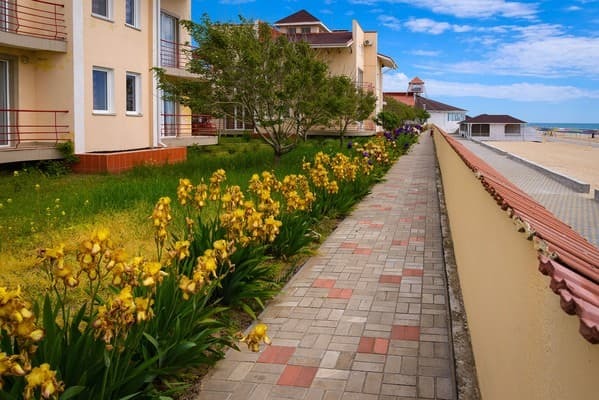 By public transport: to Odessa (railway station, airport) from the airport by shuttle bus number 117 to the railway station, from the railway station - by the Odessa-B-Dnestrovsky train or by taxi # 560 to the Druzhba stop. By car: Enter Zatoka after Karolino -Bugaz, you pass the bottleneck. After 3 km after the narrow place you will observe us from the left side of the road. Continue to go - move the bridge, then after the railway crossing turn left so that the central alley Zatoka was on your right side. Be careful and follow the layout. The traffic police officers often stand there and control violators. Then you again go straight and move the bridge. After the bridge, the main road will go to Odessa through the railway crossing, you also before moving to the right. Eat along a well-paved road a few more kilometers. We are almost at the very end of the Sunny district.